Note: Copy any of the above Tokimeki Memorial Girl's Side 3rd Story (Japan) rom download links and paste it into your browser to download. Anyone with a Megaupload link or Rapidshare. Downloads so damn slow. Ap measures confirmed ? doesn't work yet !? Downloaded like two roms today, none of them work. Anyone know where there's a rom that works on R4? Thanks vivian ! but...doesn't work for me ! The rom are bad or need patch ?? Loads fine on Acekard 2i AKAIO 1.7.. I can enter the game without a problem and doesn't have saving/loading save file problem too..
Mediafire link for part 3 is wrong? how do i know which one it is?? r4 doesn't work i guess. I have an Acekard 2i AKAIO 1.7, and this game is really work perfectly on it! Acekard and R4I are not same ? Can't read on R4i now ? it stucks when the "almost confession"
Sorry, I don't know how to use the patch...can anyone give some quick instructions? i did that. the patch was 3 files right? extinfo infolib and savlib? it didn't work. I have an r4 and when I open it. The TTMEnu is with my games, is it right? or should the TTMENU be placed elsewhere? i put the game with my other games and in the TTMENU folder but still white screen. Hm, I have an r4III, and it gives me a white screen, it doesn't even go to the title. I tried YSmenu, but it didn't help either. So, any ideas anybody? R4i and tokimeki : always impossible ? No patch ? No fix ? for R4, Wood R4 1.08 works perfectly. somebody can explain how to do ? Tried to download from several links. After ~55% it stops and gives and ERROR message about a server reset. Has anyone a torrent link for this? I can't play it in dstt? I had already do patch and change name but it always appeared white screen. T_T help please! 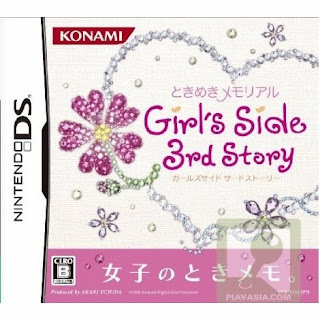 Someone can play at Tokimeki with YSmenu ?? i tried to download with WinRar but it always say that I need some kind of Volume to save the file. cud anyone help me please? I've got R4 SDHC card and it didn't work. I tried Wood R4 SDHC and Ysmenu. The screen is always white. What can I do? Tried with a R4i SDHC and got the YSmenu running and all but the game wont boot. It's just saying "Error" "r4patch.dat NO BOOT_LOADER" "ok" and nothing happens. It wont even start the game. Works with Wood R4 1.10!! I'm going crazy right now! Lol! I'm just having no luck... I have R4 SDHC, and neither YSMenu or Wood worked... I even tried to download files that would allow YSMenu to work on SDHC, but still nothing... When I use YSMenu, and pick Tokimeki, it says "UNKNOWN_DLDI_TYPE"... So... can anyone maybe shed some light on this? Anyone with a R4 SDHC who got Tokimeki to work? Can anyone help me how to download the wood R4 lastest version, all i got was (12065-wood_r4_v1.10.7z), no rar to extract. What's wrong with it? >it stucks when the "almost confession"
I've given up on r4i. I ordered an Acekard 2i just so I could play this game. Too many games stuff up on r4i. Help me, i'm fine with EDGE! but the BGM sound is so AWFUL!! its not like at the youtube!! Please help me, i can't enjoy playing if the songs like that! I can't get it to work on my SuperCard DS One. Any ideas? Hexedit? Patch? I tried with acekard akaio 1.7 and it have block my card!!!! now my NDSi doesn't detect it!! please help, what do i do??? though i format my micro SD a change it my NDSi still doesn't detect the card....please help!! So... anyone know any way for me to play this game on a R4 SDHC Ultra card? All of my attempts at using Ysmenu and Wood have failed. Maybe it's not possible? Can someone point me in the right direction? R4 Clones with "Wood R4 for R4 Clones"
I suggest you use any of the above ones. Be careful!!!! Acekard akaio 1.7 doesn't work!!! this game will block the flashcard and your NDSi won't detect it anymore !!!! I tried it and i had to buy a new acekard.